➲ Auto Update-Buff [Premium] - Update buff when change equipment. ➲ Language File [Premium] - Edit message that will be displayed in the game. ➲ Special Power [Premium] - Add unique power to the item by click mouse. ▶️ Blink [Premium] - Teleport in directional view. ▶️ Fissure [Premium] - Shake the ground and summon lava burn. ▶️ Ice Spikes [Premium] - Summon ice pillar in horizontal view. ▶️ Amaterasu [Premium] - Burn enemy with dark flame. ▶️ Nero Beam [Premium] - Shoot beam that causing slow to enemy. ➲ Lore Stats - Add custom stats to the item based on key lore. ▶️ Damage [Weapon] - Add damage to weapon. ▶️ Penetrate [Weapon] [Premium] - Ignore enemy defense. ▶️ PvP Damage [Weapon] [Premium] - Bonus damage when attack Player. ▶️ PvE Damage [Weapon] [Premium] - Bonus damage when attack Non-Player. ▶️ Defense [Armor] - Add defense to armor. ▶️ Health [Armor] [Premium] - Add defense to armor. ▶️ PvP Armor [Armor] [Premium] - Bonus defense when attacked by Player. ▶️ PvE Defense [Armor] - [Premium] Bonus defense when attacked by Non-Player. ▶️ Critical Chance [Weapon] - Add chance to critical attack. ▶️ Critical Damage [Weapon] - Multiple damage when critical attack. ▶️ Block Amount [Armor] [Premium] - Percent damage that will be blocked. ▶️ Block Rate [Armor] [Premium] - Add chance to block attack. ▶️ Hit Rate [Weapon] [Premium] - Add chance to hit enemy. ▶️ Dodge Rate [Armor] [Premium] - Add chance to evade attack. ▶️ Durability [All] - Set durability of items. ▶️ Level [All] - Set level of items. ➲ Ability - Add passive effect to items. ▶️ Poison - Make victims poisoned. ▶️ Wither - Add wither effect to victims. ▶️ Vampirism - Drain health from victims. ▶️ Cannibalism - Get food from victims. ▶️ Freeze - Summon ice pillar that causing enemy frozen. ▶️ Roots - Pull down enemy to the ground. ▶️ Curse - Prohibite victims to get healed. ▶️ Slow - Make victims slow. ▶️ Tired - Reduce speed attack of victims. ▶️ Confuse - Add nausea effect. ▶️ Weak - Reduce melee damage of victims. ▶️ Hungry - Reduce food level of victims. ▶️ Harm - Dealt additional damage to victims. ▶️ Flame Wheel - Add more damage and causing burn. ▶️ Air Shock - Pull down enemy and launch above. ▶️ Dark Flame - Burn enemy that cannot be extinguished by water. ▶️ Dark Impact [Premium] - Blind the victim and turn view of victim to backward. ▶️ Venom Spread - Spread poison to all enemy around victims. ▶️ Venom Blast [Premium] - Spread poison and causing explosion. ▶️ Bubble Deflector - Shoot bubble that causing slowness. ➲ Power Command - Run command when clicking the item. ➲ Power Shoot - Launch projectile when clicking the item. ➲ Buff - Add passive buff effect to items. ➲ NBT-Tag Items - Set NBT-Tag of items. ➲ Element [Premium] - Add element to items. ➲ Socket [Premium] - Input gems to items. ➲ Lores - Edit lore of items. ➲ Enchantment - Add and remove enchant very easy. ➲ Display Name - Change display name of items. ➲ Detail - Look all details metadata of items. ➲ Database - Store items that already made to the database. ➲ Damage Modifier - Modify damage in the server. ➲ Support JSON - Support all type JSON. ➲ Full Configuration - All option is allowed to change from the config file. ➲ Full Sound - Each action determined by sound. ➲ Full Effect - Every feature has a unique display. ➲ Full Tab Completer - If you don't know how to fill the command just click [Tab]. Chèn lore mà không cần tháo lore trước. Loại enchant cụ thể khỏi item bị giữ. ➩ /Socket Add [<line>] - Add slot empty socket. 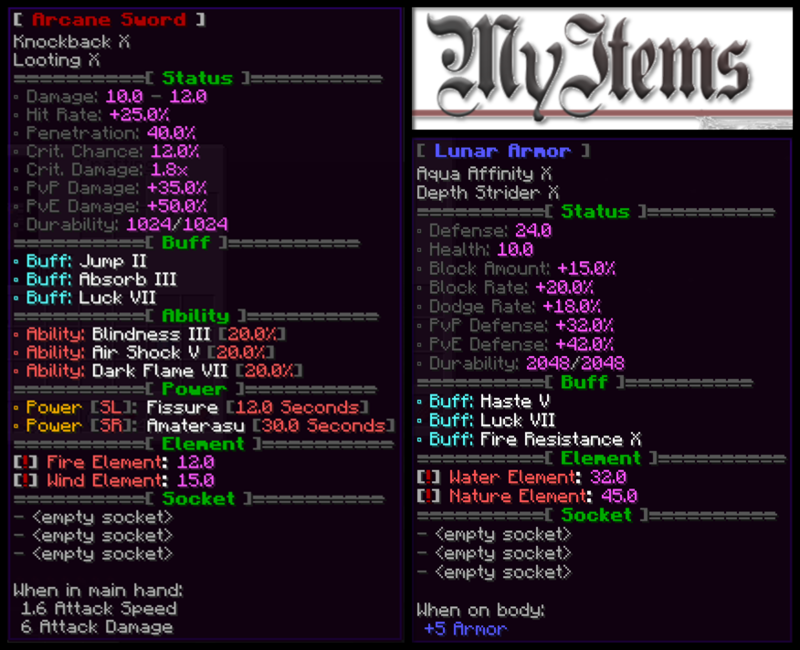 ➩ /Attributes stats <lorestats> <value> - Add lorestats to held item. ➩ /Attributes buff <buff> <grade> - Add buff to held item. ➩ /Attributes ability <ability> <grade> <percent> - Add ability to held item. ➩ /Attributes nbt <nbt> <slot> - Add nbt tag to held items. ➩ /Attributes element <element> <value> [Premium] - Add element to held item. ⇰ /... power command - Run command when click. ⇰ /... power shoot - Launch projectile when click. ⇰ /... power special [Premium] - Cast special power when click. Hiển thị tất cả dữ liệu của Myitems. ➩ /Myitems save - lưa dữ liệu. ➩ /Myitems load - load dữ liệu. ➩ /Myitems reload - Reload phần config. Yuuki hamaro, Vỹ Phê Cần, nhungtran8279 và 28 người khác thích điều này.